Bacterial aggregation and adhesion are ruled by specific and nonspecific adhesion mechanisms. In the case of the probiotic strain Lactobacillus plantarum 299v (Lp299v) the biochemistry of adhesion has been previously studied and s-layer proteins have been identified. However, physic-chemical mechanisms which ruled the aggregation and adhesion phenomena able to change through the time under different pH conditions have not been completely elucidated. 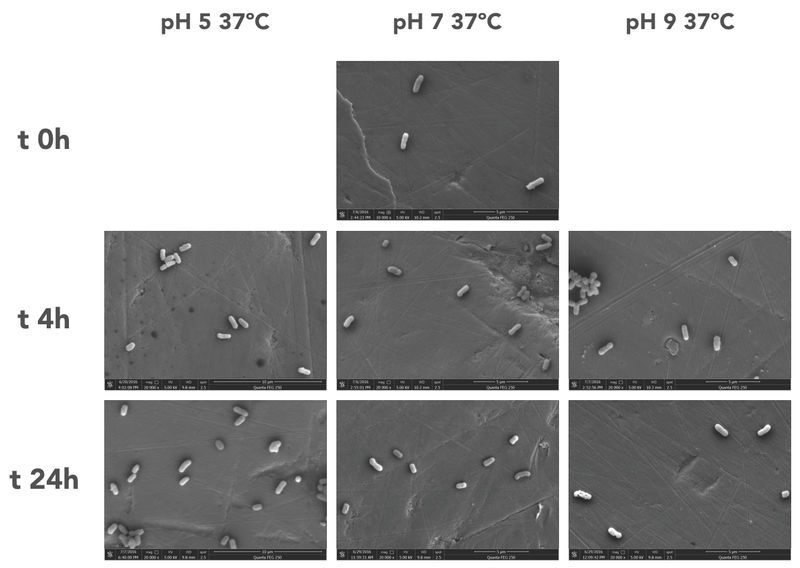 The non-specific adhesion mechanisms (hydrophobicity, zeta potential and morphology) of Lp299v auto-aggregates over time (24 h) at different pH levels (from 5.0 to 9.0) on starvation were described. Auto-aggregation resulted in greater dependency on time. The Lp299v cell surface showed a higher level of affinity with chloroform than n-hexadecane, while the zeta potential was a negative charge in all cases. Size and shape parameters were found to be dependent on time and pH. A strong Pearson correlation (0.991) was observed between circularity and auto-aggregation. In conclusion, Lp299v’s nonspecific adhesion mechanism was found to be more related to time than pH levels, indicating that Van der Waals and hydrophobic forces and shape parameters have the potential to dominate the autoaggregation of Lp299v. However, the predictive model presented shows that lower pH may promote auto-aggregation and thus facilitate the colonization at the upper level of the digestive system. Escuela Nacional de Ciencias Biológicas. Unidad Profesional Adolfo López Mateos. Av. Wilfrido Massieu Es. Cda. Miguel Stampa s7n. Col Zacatenco. Cp. 07738. Ciudad de Mexico. Mexico. Laboratorio de Genómica Humana, Facultad de Medicina, Universidad Veracruzana, Calle Médicos y Odontólogos S/N., Col. Unidad del Bosque, C. P. 91010, Xalapa, Veracruz, Mexico.